DubaiSat-2 is the second Earth observation satellite of United Arab Emirates Institution for Advanced Science and Technology (EIAST). 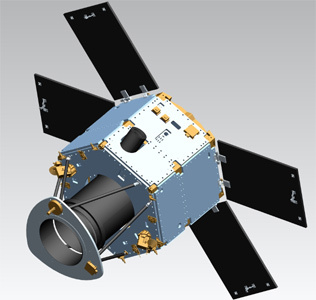 The DubaiSat-2 project is a joint development programme between EIAST and SatrecI of South Korea, in which 16 UAE engineers have been working on the design, development, testing and manufacturing of the satellite. A Hall Effect Propulsion System (HEPS) is installed for orbit control and maintenance. Accurate and agile three-axis attitude control supports precise imaging operations. Dual redundancies are adapted where necessary in the system architecture design to increase reliability of the satellite system. As the predecessor DubaiSat 1, it is built by Satrec Initiative to be launched in 2012. DubaiSat-2 is based pon the SpaceEye-1 configuration, which uses a SI-300 bus and the EOS-D camera. EOS-D optical payload is a push-broom type camera with 1 m Ground Sampling Distance (GSD) for a panchromatic band and 4 m GSD for four multi-spectral bands. Swath width of the generated image is wider than 12 km. A high performance solid-state recorder is installed to receive, process, store and transmit image data in high speed. During transmission of the stored image data using X-band transmitter, the solid-state recorder compresses, encrypts and encodes the data in real time. The satellite was launched in 2013 together with other small satellites by a Dnepr from Dombarovsky (Yasny).